what can we do again? how about children? how about our family? 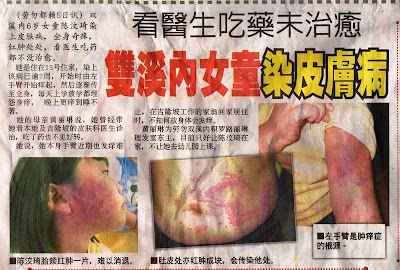 those who keep on saying cyanide is safe to be used is unscrupulous and shameful!the symptoms shown on the poor little girl's body speak the truth!i don't know who will be the next victim like mr. chong... but i know we will never be silent anymore! our fire of anger is now burning!we will do whatever thing via whatever means to protect our family and get rid of the cyanide threaten! let's we hold our hands together to say NO to the main culprit!